On Monday the Flagler County Commission took its final vote approving a land use change south of Sea Ray Boats’s property off Colbert Lane, enabling the manufacturer to build a 24-acre parking lot. The Flagler Beach City Commission has consistently opposed the plan. The commission makes two central arguments: it sees the parking lot expansion as an eventual expansion of manufacturing capacity–a suggestion Sea Ray has strongly denied. The city commission sees the expansion as further jeopardizing quality of life in the city, because of noise issues that would affect Lambert Avenue residents, and because of the smell of styrene, a known carcinogen, emanating from the boat plant. Since the county’s votes approving a zoning change and clearing the way for lot construction, the city commission has debated whether to appeal the decision to the state, by way of a challenge to Flagler County’s comprehensive plan amendment (which enabled the rezoning). But city commissioners are unclear about whether they have legal grounds to appeal, especially since the state ratified that comprehensive plan amendment. Commissioners have asked their attorney, Drew Smith, to draw up legal options. The commission meets in special session Thursday (Aug. 6) at 2:05 p.m. to discuss the matter and possibly take action. It is no longer certain that the commission will be united on the matter. Its former opposition to the Sea Ray plan was directed at the county commission. With that vote over, some city commissioners have voiced more hesitancy about pressing the fight further. On Wednesday, Sea Ray Boats issued the following open letter to Flagler Beach. The purpose of this letter is to clarify some points before the Flagler Beach City Commission’s meeting Thursday afternoon. At that time, the Commission is expected to consider filing an appeal to Flagler County’s recent approval of our request for rezoning. First, the proposal is — as they say — what it is. Sea Ray has received approval from the Flagler County Commission, which has jurisdiction over this matter, to rezone the property for use as a parking lot, finished boat staging and possible future office space. While some have claimed the new parking lot is some veiled attempt to increase production, it is not. Further, any claims that Sea Ray is exceeding or ignoring environmental concerns are false. Sea Ray is well within the applicable standards and works hard every day to improve in this area. We do so not only because it is the law, but because it is the right thing to do and we also truly value our presence within the community. We work and live here as all of you, who are our neighbors, do. Throughout this process, Sea Ray has actively and candidly communicated its intent in seeking this zoning change. As we complete this process and continue to move forward, Sea Ray will continue to openly share its plans with the community to keep you informed and seek your assistance and feedback. We are seeking this approval so we can have safe, convenient parking for our employees. We believe this new parking lot is our best option to provide all in our workforce more convenience, improved safety over the current crowded conditions, and also offer Sea Ray increased efficiency by freeing up space within the existing property and physical plant, perhaps for additional covered mold storage and warehouse space. These efficiencies are absolutely essential to maintaining and advancing the competitive advantages we now enjoy to continue to compete in the global marine market. Again, while relocating our parking lot would make the operation safer and more efficient, its purpose is not to increase overall production levels. We hope that all of our neighbors in Flagler Beach, including the members of the Flagler Beach City Commission, will carefully sift through what is sometimes emotional rhetoric to examine the facts of the situation and take a step back to carefully consider the next steps in this matter — and the potential impact upon our employees’ safety and Sea Ray’s ability to sustain its advantages and compete and thrive in the global marine market — before taking any action. 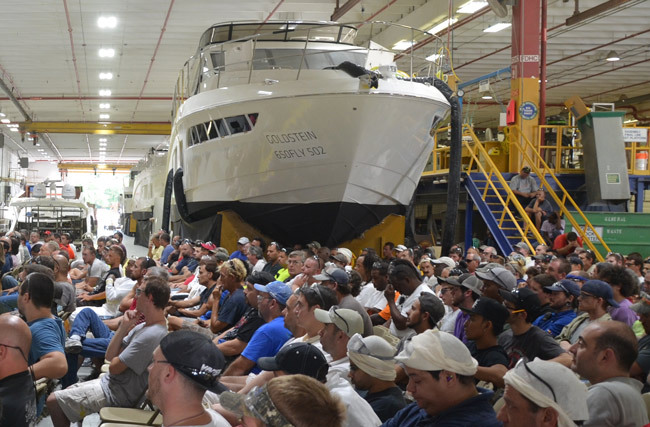 To these two points — maintaining our competitiveness in the market, and especially the safety of our employees — no one should underestimate Sea Ray’s resolve and willingness to deploy resources to uphold both. We hold dearly to those goals and have demonstrated our commitment through the years to achieve them. And while we don’t question the commission’s motives in this matter, as a long-standing member of the Flagler County community — having been operating at Palm Coast for more than 30 years — we are also left to ponder if filing an appeal is a wise and prudent move on the part of the Flagler Beach City Commission. By its own admission, the City Commission is uncertain of its legal standing in the matter. And as with any such action, the ultimate outcome of such an appeal is uncertain. What is certain in taking such a step is that considerable taxpayer resources, such as money and time, for starters, will be committed to a process that could be both protracted and expensive. It is not for us to say if it is a wise use of such resources when Flagler Beach, as any number of municipal governments, is facing so many other challenges requiring careful and effective use of finite funds and other types of assets. We hope that Mayor Linda Provencher and those commissioners who serve with her will exercise sound judgment in their decision. If anyone actually believes a big corporation like Sea Ray gives a rat’s behind about our environment, our beaches, our residents, or even their own employees, they are fools. Big business doesn’t stay big by caring about people. It’s all about the money just like it always has been. Someone’s pockets are getting lined – Any commissioner care to step up and admit it? the Flagler Beach citizens that live near SeaRay want nothing more than for it to close down. Those citizens should be held liable for the displaced workers. I, for one, believe Sea Ray’s intentions to be a good neighbor, including plans to use technology to control emissions. Jobs are critical in Flagler County. I hope the good Commissioners of Flagler Beach will see the big picture and not appeal the parking lot decision to the State of Florida. I’ll bet that if cooler heads prevail, that Sea Ray and Flagler Beach could work together to solve problems that come along as we move forward together. A much needed statement from a responsible manufacturer of premium boats in a community of rich water access and focus on recreation, tourism and fishing. A unique FIT for a commercial enterprise within a complementary setting. Being civic minded and in the same location for 30 years proves their sustainability and commitment to Flagler county .If a few disaffected citizens want to control a parking lot, what about all the tax paying employees who work at the plant and live in the community. Just let them keep jockeying for a parking space like at a music festival on the grass. Please wake up to the benefits of a good corporate , jobs provider here, and TRUST that Sea Ray will continue to be a good corporate citizen here for the next 30 years. ! Why didn’t Sea Ray expand to the west. The area off Roberts road has several small vacant buildings, it seems that the entire fiasco could have been avoided with the same results. The area I’m speaking about goes from Roberts Road all the way to the Sea Ray Canal, The only use I’ve seen of that land in the last 10 years was storage for Sam Cline Construction. The citizens of Flagler Beach will miss Sea Ray. The mother company, Brunswick Boats, will eventually get tired of the “antics” of these two-bit, nothing else to do, politicians. Folks…this should be a “no-brainer”. No wonder no companies want to come to Flagler County. You have folks and a city commission that still think it’s living in the 1950’s, and want to stay that way.. I have been following this from day (1),it is hard to believe that a small group of folks following one man because he has changed his mind can ruin they lives of 700 families. Sea Ray has done nothing wrong and is well within the environmental guide lines of the DEP. / OSHA and all other agencies. It is a parking lot. Live and let live. This is so frustrating to watch. It’s a parking lot, a parking lot.. Worried about property values? Well wait till they close up shop and see how your property values fare. This community needs more Sea Ray type businesses. I wonder how many of these so-called “environmentally concerned” residents of Flagler Beach who are fighting Sea Ray’s parking lot expansion own boats themselves…And how very concerned they are about the environmental damage their own recreational boating is wreaking on the ecology of the area.